Thank-you for reading Chainsaw Journal and taking the time to join our email list. We’ve assembled some of our favorite products we discovered and covered on this site. Some products have been around for a while while others are new — either way, we just wanted to share them with you. Our criteria is simple: Is the product innovative, well-engineered, practical and/or worth your money. The one thing that all of these products have in common is quality. They must be well-made and useful to be on this list. If you’re looking to discover some cool tools, you’ve come to the right place! With so many chainsaws, hammers, generators and axes on the market, it can be difficult to know where to start. Luckily for you, we’ve made things a bit easier. From swimming pool cleaners to steel-blade axes, we’ve compiled ten must-have products that provide accuracy, speed, and power. So, what are you waiting for? This list will continue to grow. It’s not static. We intend to make this the definitive guide for yard tools but it will take time. Please be patient. Also, new tools are released throughout the year, so when we uncover a cool new tool then will we add it to our list. For us, this is a fun resources to create. It’s an article where we can dream and share what we think is cool, practical, innovated or just pure fun. Hopefully you’ll discover some products here, or be introduced to some classic tools that have stood the test of time. Or maybe you’ll find some unique outdoors toys that you children might enjoy or perhaps, something you can bond with your child over. We don’t know what this list will become in the future but I’m confident it will be a unique article for people to read and learn about about the best yard tools and outdoor toys that money can buy. Please feel free to contact us and share your own favorite tools. Maybe it’s an old tool or gadget you received when you were younger. You can even send us a photo and we’ll include it in our article so other readers can see it. Let’s face it, we all love to reminisce about the cool stuff we had years ago but are now long gone. Share your old tools and toys with us and we’ll share your photos and story with our readers. Contact us via email. ✓NOTE : The list is in no particular order — just some very cool tools, outdoor toys and power equipment. we recommend having a kleenex nearby just in case you drool. Very affordable. Consider this a bargain considering everything you get. When you need power — and FAST — look no further than this super-generator which comes with a powerful 7HP, 4-stroke single cylinder engine complete with an air cooling system. This engine offers a whopping 3500 watts of power without breaking a sweat and can run for 11 hours at half load. Sounds pretty good, right? There’s a wheel kit included which makes transportation really easy (just wheel it around, whenever you need it) and you get a 2-year limited warranty for peace of mind. Other features we liked? The 4-gallon fuel tank, automatic shutdown, and easy-to-use design. This is a must-have for any homeowner who needs power quickly. 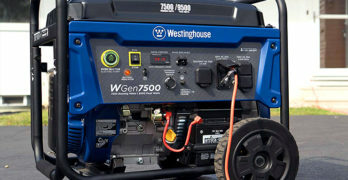 WEN is a quality brand and this product is no exception; this portable generator provides great value for the money and can be used for a variety of applications. Looking for power for your fridge? Freezer? Try this product, which pretty much ticks every box. It has a solid steel frame, but more importantly, it’s a lifesaver in an emergency situation. You’ll also love how easy it is to set up, with simple-to-attach handles and wheels, and all the tools you need to get started (just follow the included manual if you need help). One final thing to remember: This WEN generator comes with a voltage selector, something you won’t always find on other products in this price range. There are so many great generators on the market but we have made an attempt to choose the best ones to make your buying decision easier. Here are a few useful articles for your research: WEN generators guide, best generators for the money, best 2000 watt generators for homeowners and perhaps the ideal place to start is by reading: What size generator do I need? Equivalent to a 45cc gas chainsaw — without the fumes and noise. Make using a chainsaw less of a chore with this 80-volt beast from GreenWorks. When fully charged (it comes with a 2AH battery), it provides up to 150 cuts, which we’re sure you’ll agree is mighty impressive. Its charging time stands out among its numerous features – just 30 minutes in case you were wondering. Other features include a durable metal wrap around the handle, electronic chain safety brake, steel bucking spikes, and DigiPro brushless motors. Best of all, it has the equivalent power of a 45cc gas saw. Yes, we know that you might have reservations about a battery-powered chainsaw, but this product really does the trick, especially when chopping through thick wood up to 16 inches in diameter. Although the product is heavier than some battery chainsaws (13.7 lbs. ), it’s brilliant at clearing up debris after a storm. In short: Choose this product if you want a chainsaw that does the job without compromising on power. Use it to fell trees, cut firewood, limb, and prune! This is definitely one of the best chainsaws for homeowners. Want to know more? We have covered the 80V GreenWorks chainsaw in several articles but you’ll find the most concentrated information in our comprehensive review. Well-suited if you live in an area with huge snowstorms every year. Here’s another product from Husqvarna. The ST224 Snow Blower is powered by a 208cc gas engine. It allows you to clear snow up to 12” high and has a 24” clearing width. Made with an LED headlight to illuminate the way when it’s dark outside. If that wasn’t enough for you, check out the 180-degree remote chute rotation (this comes with its own remote deflector), a 2.7-liter fuel tank and friction disc transmission. The 15-inch tread tires are designed for powering through deep snow while the heated grip handles are a nice extra when the temperatures drop well below freezing. There’s even an electric start feature where you can plug in an extension cord. Like we mentioned with the 450 chainsaw, Husqvarna is always there to answer your questions if you get stuck during set-up. The Husqvarna ST224 is a heavy-duty snow blower, engineered to keep driveways and pathways clear from snow, and it’s user-friendly enough for a first-timers. Perfect if you live in a city that gets a lot of snow year after year. Overall, this is an excellent value and it’s built like a tank. We have much more information on the ST224 in our feature article. It goes into more detail of it’s features and capabilities. Yes, this jacket is warmed by a battery. Very cool technology. Looking for a jacket that will keep you warm whatever the weather? This heated jacket from DeWalt – part of the company’s Heated Jacked line-up – should do the trick. You get four pockets, four core heating zones (one of the left and right chest, one in the mid-back, and one on the collar), and an adjustable hood. The jacket feels comfortable to wear and has an attractive design so you definitely won’t look stupid when you have it on. Best of all, there’s an LED controller with three different temperature settings which runs on 12V or 20V max DeWalt batteries. Stylish heated jacket for women. Need to charge your phone when out and about? No problem. Just use the USB cable and charge your smartphone in your pocket. Other features include durable metal snaps on the hood, a metal zipper, stitching on the cuffs, and a wind guard for adverse winter weather. Everything you need is included with the jacket when you purchase the product, including the battery and charger, so you won’t have to splurge on accessories at a later date. Get this if you want a wind and water-resistant jacket that has plenty of customization options. Unlike some other jackets, there are male and female options available. We included these jackets in our article on Christmas Gift ideas for people who love the outdoors. Perfect balance, lightweight, powerful and versatile. The ideal chainsaw. Here’s another chainsaw that you need to know about, and just like the GreenWorks 80V, it comes packed full of features. On first glance, the product might be best suited for landowners who need to cut wood on a semi-regular basis, but it packs on hell of a punch and is equipped with super-powerful 18-inch blades. The Husqvarna 450 is bright orange and has a contemporary design, offers an air cleaning system and comes with a snap-lock cylinder cover for extra safety. Better yet, it weighs around 13 lbs, making it easy to transport wherever you are. Other features you’ll love include an inertia-activated chain brake, Smart Start feature (which makes starting the chainsaw less of a chore), and exceptional anti-vibration technology. Everything you need to get started is included with the product. This is a semi-pro chainsaw. Husqvarna is renowned for their excellent customer service too, so you’ll be able to contact a company rep if you have a question or query. Choose this product if you’re looking for a chainsaw that can increase fuel efficiency and reduce exhaust emissions without jeopardizing power. One final thing: This Chainsaw is CARB-compliant. What else is there left to say? See what other gas chainsaws we recommend by reading our article on the best gas chainsaws. The safe way to make kindling. Made from cast iron. Now for something completely different. If you want to create kindling for a pizza oven, wooden stove or campfire but don’t want to use an axe, this product is right up your alley. It’s manufactured in New Zealand and consist of two separate pieces of cast iron; moreover, it only requires very little in the way of maintenance. Perfect for kindling, the product weighs just 10 lbs and is 12” in length. You’ll probably agree that this would make a great gift and it’s designed to be safe and easy to use. This will last a very long time. No longer will you need to use an axe to chop kindling – this is far more efficient. Place firewood inside the safety ring and use a hammer for a quick separation. Try it for yourself and see! This simple, safe and easy-to-use design began as a science fair project when a young student wanted to create a safer way to split firewood into kindling. Simple and effective! Can handle logs up to 10″ in diameter and 20.5″ long. Another one of the 10 best tools of 2015, Boss has been a huge brand when it comes to industrial products for years now, and this electric log splitter certainly lives up to expectations. First up, it’s completely portable, allowing you to wheel the product in and out as you see fit. It even offers one-handed operation for quicker transportation, as well as an automatic ram that gets the job done in a quicker time frame. You’ll love the design – it’s contemporary, sleek, and well-engineered. Has an easy push button to start and stop the product, and a 2 HP electric motor to easily split wood. Use this if you want a professional-grade hydraulic system at an affordable price. It’s sturdy, durable, and can handle logs up to 20.5” in length and 10.5” in diameter. You can operate this splitter with one hand for greater convenience, but be careful where you put the other hand. Yes, log splitters are dangerous. Be safe. It’s compact and easy to store in a shed, barn or even your living room. Because it’s electric, you can use it indoors safely. No fumes to worry about. The product weighs 117 pounds. Learn more by reading: affordable electric log splitters and our wood splitter buying guide. Yup, this is a 4×4 pool cleaner. Well worth the time it will save you. This robotic pool cleaner from Hayward is a wonderful gadget if you want to clean swimming pools quickly and effectively. The Aquanaut 400 (Model: PHS41CST) is one of the best pool cleaners out there and comes with a powerful 4-wheel drive system allowing it to go anywhere. With super suction power, the product can be used for any pool terrain, including stubborn areas of home pools. So, how does it all work? Well, the product relies on V-Flex technology which provides power at various flows and is able to deal with debris without the product becoming clogged. It has a roller skirt (which is adjustable) that keeps suction at a constant on different surface areas, making pool cleaning easier than ever before. Its 4-wheel drive can clean shallow, deep, small, or large pools, and can be used with different speed pumps. Choose this product if you want something that provides a quicker, more comprehensive clean. It navigates with confidence and avoids any obstacles that come its way, including drains. Read our feature article on the AquaNaut 400 (and 200). Rocks, dirt, barrels, plants — the Aerocart can move almost anything. This multifunction wheelbarrow from WORX provides great value for you money because it’s essentially eight products in one. Lift heavier items without the strain, designed in such a way that it reduces lifting force by up to 400 percent. It’s true. Perfect for both indoor and outdoor use, the wheelbarrow has a contemporary design and is compact in nature, making transportation and storage easy. It has a wide range of accessories to cater to your needs. For example, you can attach the WORX plow for snow clearing. The Mesh rock lifter easily moves rocks by quickly connecting to the extension arms. Meanwhile, the cylinder holder makes transporting items around your backyard a piece of cake. You can even move trailers up to 100 lbs with the Work Aerocart and save money too (you would usually have to shell out on all the additional extensions and accessories if you wanted them, but they’re included with this product). If you want to save time lifting objects and want access to different customization options, go one step further and convert the product into a heavy-duty hand truck by moving the bottom flap down and changing the wheelbarrow into a dolly. Use it to move furniture and other heavy items up to 300 pounds. We have a dedicated article that has plenty of videos, images and accessories for the WORX Aerocart — providing you with a wealth of information on this impressive 8-in-1 wheelbarrow. For splitting firewood, this is an excellent choice. The final product on our list is the Super Splitting X27 from Fiskars. It’s 36” in length and has added heft to improve splitting efficiency. This axe is perfect for tall people. Ergonomic and designed to feel good in your hands. It has a shock-absorbing handle to take the pressure off every hit. Crafted with Fiskars proprietary grinding technique which creates a sharper edge than other axes. It maintains its edge for a long period of time. Also comes with a low-friction coating on the blade. This axe is almost impossible to break, with a stronger-than-steel FiberComp handles and inseparable insert-molded heads. Choose this product if you want an axe with durability, power, and accuracy. This axe will greatly increase your one-strike splits. By the way, Fiskars has been around since 1649, and currently it’s one of the oldest companies in the world. They know what they’re doing. Learn more in our guide to buying a splitting or chopping axe. We focus on Fiskars axes in the article but also provide information that will ensure you’re choosing the correct axe for your needs. This is not the end as we promise to continually grow this list and keep it fresh with tools, power equipment and the occasional outdoor toy that we adore and want to share with our readers. We’ve tried to include a wide range of brands, as well as products in different price ranges to keep things interesting, but we want to know what you think. Have you used any of these tools? Do you have any recommendations of your own? We welcome your feedback. Please, feel free to contact us to share your thoughts, opinions or personal recommendations. What are your favorite tools?